For parents, the Amtryke fills the need of every child to have a bike—just like their siblings and friends. Many riders not previously considered capable of riding a bike will be successful riding an Amtryke. 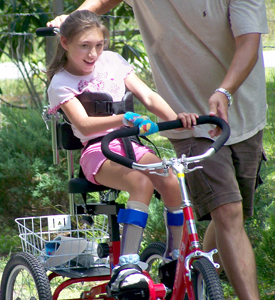 Our trykes are designed to look like bikes, not medical equipment, and to be age appropriate. Parents tell us all the time about how the Amtryke has improved their kid’s life. It’s not just the obvious benefits of exercise but also more subtle things like improved family and peer activity inclusion as well as a sense of empowerment, self-reliance and freedom. 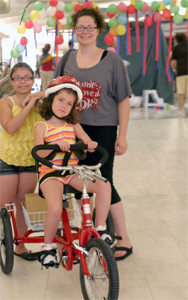 With that Ellie started to pedal the tryke, and tears began running down Mom’s face. Now instead of being pushed through the halls of school in a wheelchair, Ellie rides her Amtryke. It is included in Ellie’s Individualized Education Plan and is part of every school day. The Amtryke isn’t magic, it’s just a very useful tool. Because children should only use the Amtryke with adult supervision, improvements are almost always in direct correlation with a parent or guardian’s commitment to providing opportunities for their child to ride. Not every child with different abilities needs an Amtryke. Some kids do very well with a tryke from a big box retailer. For kids that only need a little help, we sell foot assists and hand assists that can be used with most bikes or trykes. Most of our bikes employ a fixed drive, or ‘fixie.’ The fixed drive doesn’t allow coasting so whenever the tryke is in motion, the pedals are in motion for full therapeutic effect. It also works on a mechanical level to help a child make a full pedal rotation. 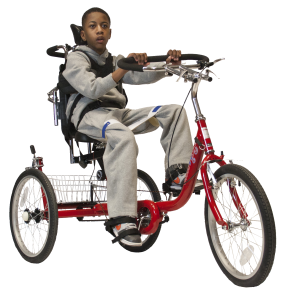 We make classic foot pedaled trykes, ones that can be peddled with just the hands and others that are pedaled using both hands and feet. We offer an impressive array of adaptive accessories. 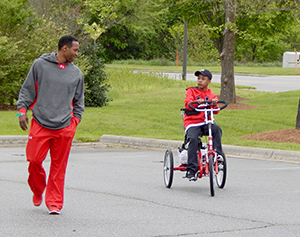 Adaptive tricycles are expensive. AMBUCS is a nonprofit so ours tend to be less expensive than most. But we understand that most families that include a child who would benefit from an Amtryke are under financial strain due to medical and therapy bills. We can help! If you are reaching out to a chapter or placing your child on the Wish List, the first step is to get the three required documents filled out.